What nutrition course do you suggest I do? What qualifications do I need to work as a nutritionist? I’m a personal trainer/coach, what is the best way to improve my nutrition knowledge and/or my reputation as a nutrition coach? I currently work in a different field but want to transition to a career in nutrition. How should I go about this? Is it possible? I’d like to work in sports nutrition. How do I go about this? So the plan is to address these questions comprehensively in this guide. Which should hopefully help those of you who have similar questions. So let’s get started! Before we get into the real nuts and bolts of this issue, I’m going to talk about my own background. Not because I think it’s the “best” way to go or even a useful comparison. But rather, because I know that people are interested to hear it. Or at least, it’s a frequent question in the emails I get about career advice. Prior to there being a Sigma Nutrition, I completed a MSc. in Nutritional Sciences from University College Cork, Ireland. Previous to my masters degree, I did an undergrad degree in biological sciences & physics education from the University of Limerick; after which I worked as a science teacher for a year. So, as you’ll commonly find within nutrition and fitness, the path wasn’t perfectly straight. So if you find yourself worrying that you didn’t get a nutrition degree straight out of the gate, don’t worry! Also, please bear in mind that just because I did a MSc. course, it does not mean that YOU have to do one. There are both pros and cons to formal university degrees (which we’ll cover later) and whether that step is right for you depends on a host of factors. 1) What Type of Work Do You Want to Do? The phrase “career in nutrition” is so generic and vague that it’s close to meaningless when we start to think about how to go about attaining said career. The first thing I tell people to do is to get as specific as possible as to what type of work they want to do. Being a nutritionist is very different from being a nutrition researcher. We could talk extensively about ‘nutrition-related’ careers; you could be working in public health, you could be a food industry scientist, you could be a nutrition content YouTuber! These are all jobs that are nutrition-related, yet you as an individual will love some, hate others. Think about what you actually want and what you’re suited to. What tasks do I like doing each day? What tasks am I good at? But for the purposes of this post, I’m going to make the assumption that you want to work with people on their nutrition; whether that be as a nutritionist, registered dietitian or as a personal trainer. So with that established, let’s next think about what type of populations you want to work with. Do you want to be a nutritionist working with people to improve general health and body composition? Do you want to be a dietitian based in a hospital working on clinical issues? Do you want to be a personal trainer who can advise clients competently on their nutrition? Do you want to be a performance nutritionist working within elite sport (e.g. with a professional sports team)? All these positions carry different requirements in terms of both qualifications and your personality/skillset. There are many routes into a career as a nutritionist. However, not all are equal. And there is no single “best way”. Some will be more suited to your situation than others. It will depend on your answers to the questions in the above sections. So let’s take a look at some of the primary careers that you might be considering in order to give examples of what qualifications you should consider. What course to do will depend on what your end goal is. Of course, if you want to work as a registered dietitian in a clinical setting then you need to do a degree in dietetics. For example, to become a RD in the UK, you would need to complete one of these university courses. Check with the dietetic association in your country for which courses you’ll need to do. If it’s not a clinical career in dietetics you’re after, and you want to work as a nutritionist, then there are a lot more avenues open to you. One big factor will be who you would like to work for. Are you going to be running your own practice? Do you want to work within an organization? Do you want to work in elite sport? If you want to work in elite professional sport (say with a Premier League soccer team), then you’ll need an university degree and in all liklihood a postgraduate degree (MSc. or PhD) in sports nutrition, sports & exercise science, or some other closely related subject. If you already have an undergraduate degree in either nutrition, sports science or medicine, then an additional option is the IOC Diploma in Sports Nutrition. In addition, some positions may require you to be a member of certain organizations. For example, I think (and am open to correction on this) that sports nutrition jobs within the English Institute of Sport will look for you to be a part of the Sports and Exercise Nutrition Register (SENr). You’ll also require a BSc. or MSc. in nutrition if you plan on working in something like a research & development (R&D) role within the food industry, for a company like Glanbia for example. But if you want to work as a nutritionist, nutrition coach, personal trainer or any other similar role, then an university degree certainly isn’t mandatory. However, I’m a big believer in having some understanding of the underlying nutrition science principles, so making sure to pick a course that covers some basic science and approaches nutrition advice from an evidence-based perspective is key. A BSc. or MSc. in nutrition, sports nutrition or similar is a viable option for sure. Upsides are that you get to study the topic in-depth, learn the principles of good scientific practice and have the “credibility” of having a degree (I’m skeptical of how important this last point is to be honest). In the UK, if you have an undergraduate degree then you can register as a Registered Nutritionist (RNutr) with the Association for Nutrition (AfN) for example. As I’ve said several times before on the podcast, during seminars and on social media, my default recommendation for those looking to do an online nutrition course for the purposes of either a) becoming a nutritionist, or b) improving their current coaching practice, is to enrol in Mac-Nutrition Uni. MNU is an online, evidence-based course developed by my mentor and friend Martin MacDonald. The content is excellent, the level of interaction is extremely high and the individual attention that is available is not something I think other courses can offer. Knowing Martin’s approach and the content he’s put into the course, I can 100% vouch for it. In fact, my girlfriend enrolled as a student in April 2017. If you want to get course details (and a special Sigma discount) you can go here: MNU Course Details. You’ll start to learn how different people respond differently to the same message. You’ll learn the best way to ask questions in a consultation (and more importantly, the worst!). You’ll start to appreciate the psychological and social issues that are the real obstacles for clients. And a lot of that stuff isn’t obvious. Much of it will not be things you even thought about considering. Nothing can replace what you learn through testing, failing, and refining your coaching process out there in the real world. So the more you clock up the better. 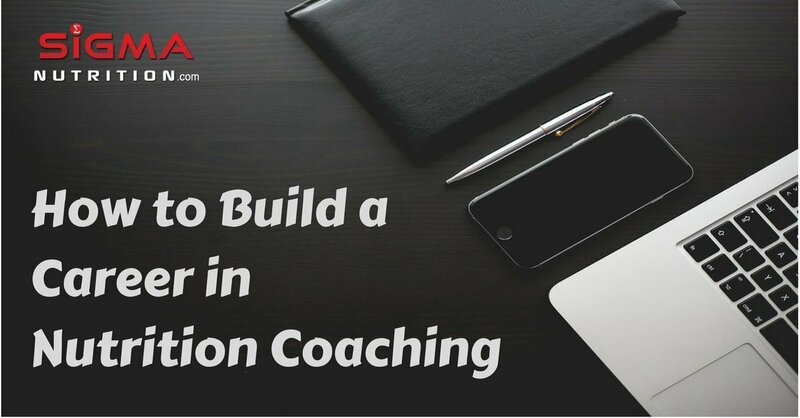 By not coaching sooner, you will drastically slow down your rate of learning and increase the time it will take for you to become a competent coach. That point of “knowing enough”, never arrives. It doesn’t exist. Ask any expert in the field of nutrition and they’ll tell you how much more they can learn and how laughable the idea that they “know it all” actually is. So suppress your fear and get to work on building as much experience as possible. Working Somewhere – If you can get a coaching position somewhere, then great. It may not be ideal in all criteria, but if it gives you access to working with people, then that’s where the value is. Better money, working conditions and freedom will come in time. For now, base your decision on what will give you the best learning experience. Internships, Work Experience, Work Shadowing – If immediate employment isn’t possible, then consider an unpaid opportunity to build experience. Again, see this as a long-term investment. Try to seek out a person/company/organization who is reputable and does good work. Use this time to a) build your experience, b) learn as much as you can from other professionals. Working for Free/”Cheap” – Another option is to go it alone. If you’re setting up your own consultancy or coaching service (more on that later), then in the early stages it may require that you work with some friends for free or take on people for very little in the way of payment. But again, see the value beyond the initial cash; you’re learning, building experience, collecting testimonials, driving word-of-mouth recommendations, etc. Talking Listening to People – Think of this as a secondary or passive, diffuse method of acquiring experience. Here you are learning from the experiences of others who have travelled the path you are planning by talking to them. Reach out and connect. Perhaps meet them at a seminar or event. Talk to them about their experiences, and more importantly, listen. Just to be clear, I don’t mean this as some sort of sleazy “networking” (ugh!). This is simply talking like a good person, to another person who shares a similar interest. You’ll be amazed at what you pick up from even informal conversations with great coaches. Use them to both learn and to meet other people. It’s rare you’ll have the chance to surround yourself with so many people with the exact same deep interest in nutrition as you do. Make the most of it. Each year I host a two-day Sigma Nutrition Seminar and the 2017 version will be in both Dublin and London (details here). are an excellent way to keep up to date with peer-reviewed research without having to read (and try to interpret) the research papers yourself. For nutrition, the two I recommend are Alan Aragon’s Research Review and the Examine.com Research Digest. (If you’re looking for a similar product for strength training and bodybuilding then I highly recommend Monthly Applications in Strength Sport by Eric Helms, Greg Nuckols and Mike Zourdos). Give some background or get to know them (to some degree). If you consistently follow someones work, interact with them, be respectful and are genuinely interested in a conversation, most people will be cool with that. Demanding advice from someone you’ve had zero interaction with might not prove as successful. Be as specific with your question(s) as possible. If a question is too vague (e.g. “Wot u think of keto m8?” or the classic “Thoughts?”), then it becomes difficult to even start putting an answer together. Give some context and actually spend some time thinking through exactly what you want to ask. Word it concisely and clearly. Go through that person’s preferred channel of communication. Whilst some quick questions are fine in a social media DM, I personally find it easy to lose these questions or forget to respond, so I ask people to send it over via email if they want to ensure an answer. Be respectful of peoples time. Not everyone will be able to respond. This is especially the case for follow-up questions. A normal discussion with someone is fine. But using someone to essentially get free consultancy is not. Just use common sense. The above goes for asking some simple questions and advice to point you in the right direction. If you want something more; detailed discussion on your specific scenario, detailed advice and a mentor-mentee or consultancy situaion, then I’d highly recommend something more formal. It ensures you get exactly what you want and makes you more likely to act on the advice. For example, at Sigma we do 1 hour consultancy calls/ask-me-anything discussions via Skype. You can email across a list of topics/questions that you want to cover during the call, so that any extra material can be prepared for you if necessary. Other options include ongoing support services where you can get feedback/advice on client cases, business questions, etc. The previously mentioned Mac-Nutrition Uni offer an ongoing support group called The Mentoring Lab, which is free if you are a MNU student (non-MNU students can join here). Whilst for personal trainers who want something covering training, I highly recommend joining Lift The Bar. You can find my list of book recommendations here: Sigma Book Recommendations. Once you’ve got a suitable qualification, become insured, worked with a few people to build experience and increased your knowledge through continuous learning, you are now at a point where you need to demonstrate your value to the public. How you go about this will largely depend on your career path you are planning. This section will be most relevant to those of you planning on being self-employed, running your own consultancy, or starting your own company. However, even if you are planning to work for someone else, there is still plenty of value to building your own reputation through the content you put out to the world. I hesitate to use the phrase “make content”, as we’re currently in an industry which seems to be obsessed about content generation, to the point where it is being pushed at the expense of actually developing a successful career/business. Sure, putting out free, helpful content to the world is great and will be the backbone of future success. But I urge people to understand where it fits into the sequence of things. Maybe I’m just a skeptic but I don’t believe ranting about nutrition on a Snapchat story is all that useful if you aren’t trying to improve your knowledge and if you aren’t actually out in the real world trying to coach people. Coaching is a skill. And like any skill, you need to practice the specific thing you want to get better at. Rather than worrying how many people are watching your IG story, I think it’s more fruitful to put your energy into tasks that will make you a better coach; understanding how to communicate with other humans, learning how to be adaptable to your clients and putting in place business systems that will allow you to succeed. [Side note: Myself and Sigma coach Gar Benn discussed some of these considerations in episode 142 of the podcast]. Which you decide to place most of your emphasis in should depend on the combination of what suits your skills and personality the most, together with which you enjoy enough to consistently work hard at it. For me, the podcast is my thing. I think that medium really suits me and I can therefore do an above-average job of producing high-quality work. But for some people, podcasting would be a dreadful idea. Everyone has something that they can communicate best with. Greg Nuckols and Aadam Ali are two examples of guys who absolutely crush it by focusing on the written word and producing amazing articles. They don’t dilute their time and focus by worrying about podcasting. Martin MacDonald has built an amazing business and reputation without relying on YouTube. Whilst Jeff Nippard has found how to put out his message perfectly via YouTube. It all comes down to what will suit you (and your audience!) best. Get specific on the type of work you want to do – Type of work, population to work with, self-employed or not, etc. Get a qualification that best fits the type of work you want to do, fits your budget and current work schedule/obligations. For those looking for an online nutrition course that can be done alongside current work, then I recommend Mac-Nutrition Uni without hesitation. I’ve recommended this, and met people doing the course, who are experienced personal trainers, novice nutritionists, have masters degrees in exercise science and others who have zero previous nutrition or science background. Martin does a great job of making the course work for all those people, letting them get exactly what they need from it. Get insured to practice as a nutritionist. For example, companies like Balens offer insurance for those offering nutrition and diet advice. Continue to learn as much as you can via seminars, mentorship, reading research (or research reviews), discussing topics with other professionals and doing further study. Demonstrate your value by helping people via putting out content, doing talks and generally helping people. Consistently work hard for a long time. Interested in attending the Sigma Nutrition Seminar in either London or Dublin this November? Click Here! Note: Some of the links mentioned in this post are affiliate links. In such cases I 100% stand by the recommendation and do not include them lightly. They are all things I either use myself or have been involved with to an extent I know what they provide you. If you don’t want to use said affiliate links, just Google the service instead. However, if this post was helpful then using those links is appreciated!